Learning folks! 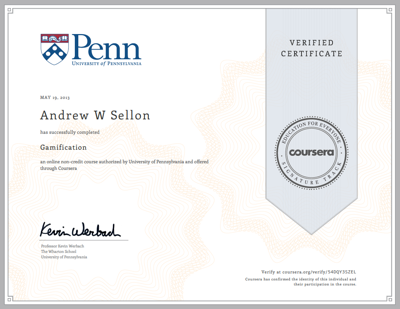 If you are serious about understanding and using principles of Gamification in your learning projects, Prof. Kevin Werbach is offering his superb and FREE online course on Gamification at Coursera starting this month (November)! Yes, this does require a few hours of work each week for the six week duration–but the assignments are fascinating and fun. You will walk away with a head full of great ideas that you can actually use. I consider this course a “don’t miss” for anyone in the learning field.